Corrugated roofing sheets provide you with a durable, lightweight and environmentally friendly roofing solution. They are particularly ideal for sheds, garages, carports, porches and lean-to extensions. 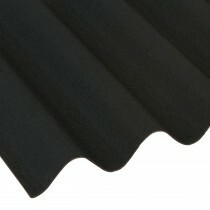 These roof sheets are also available in bitumen, plastic and steel options. Each provide unique benefits and therefore provide you with a great all-round roofing system. Through their corrugated form factor, these roof sheets can withstand considerable pressure. Bitumen, PVC and steel corrugated roofing sheets are also waterproof. Many of our bitumen sheets come with a 15-year guarantee and utilise bitumen fibres for extra longevity. PVC sheets, on the other hand, utilise innovative materials to stop distortion in high heat. Steel is virtually indestructable and therefore ideal for almost any project where maximim strength is necessary, such as on agricultural projects. Corrugated roofing sheets can be installed on pitches as low as 5°. This makes them ideal for lean-to extensions and garden houses. With few fixings and tools required, corrugated sheets can be installed easily and quickly. They are therefore a great alternative to polycarbonate roofing sheets without compromising on longevity. 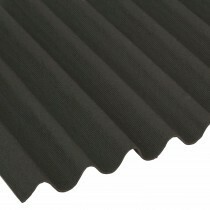 Have Questions About Our Corrugated Roof Sheets? If you have questions about our range of roofing sheets, speak to our team by telephone or via the online live chat. With over 40 years of experience in roofing, we'll help answer your questions about sheet roofing. We will also help you pick the necessary fixings and flashings for your project. You can also view all our roofing sheets here, which include tile effect sheets. Buying roofing materials can be daunting, especially when ordering them online. Howeverm, with over 40 years of experience in roofing we get asked lots of questions about our growing range of corrugated roofing sheets. Here are some of the most common questions wirth answers for each! What are the Benefits of Corrugated Roofing Sheets? The corrugated form factor of these roof sheets means they are considerably stronger than other alternatives. This is as the ‘wavy’ design is shown to withstand extensive weight and severe weather conditions. Because of their superior strength, corrugated roofing sheets are often used on agricultural buildings. Our corrugated metal roofing sheets are particularly ideal. This is largely due to them being resistant to the impact of gases and offering unchallenged durability. Our corrugated bitumen roofing sheets, on the other hand, are ideal for garden buildings. This is as they provide a lifespan of 10 – 15 years whilst remaining wonderfully lightweight. You can also introduce a corrugated PVC roofing sheets for a low-cost rooflight. Bitumen or Metal – Which Corrugated Sheet is Best? Metal and bitumen roofing sheets both offer a variety of benefits. Whilst metal is ideal for medium to large agricultural buildings, bitumen roofing sheets are best suited for shall sheds or garden buildings. Corrugated metal roof sheets are more challenging to fit. This is due to the added weight, which also demands additional structural support. Bitumen roofing sheets, on the other hand, require little structural support and can be easily fitted by a single DIYer. 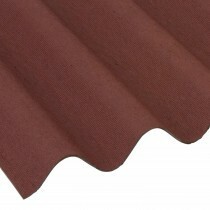 Can I Lay Corrugated Roof Sheets Over My Existing Panels? Whilst you can fit your new roofing sheets on top of their existing panels, you will need to ensure the corrugation height and width match. We typically recommend that you remove your existing roofing sheets. This will allow you to ensure they are secured to your timber frame. It will also prevent the degradation of your old panels from impacting the effectiveness of your new corrugated roofing sheets. If you have more questions about our roofing sheets, speak to our team online or by telephone. With over 40 years of experience in roofing, we’ll help answer your questions and will ensure you have everything you’ll need to complete your roofing project.